Pyramid Lake has long been known for its huge Lahontan Cutthroat Trout and its peculiarity of anglers standing in a lake fishing from ladders. 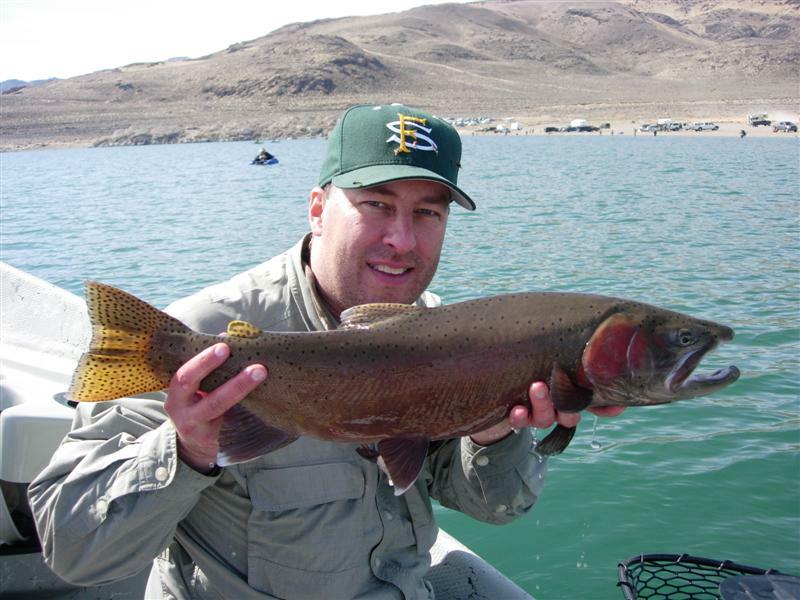 Although “Ladder Fishing” is still the most popular way to fish Pyramid Lake, the introduction of the Pilot Peak strain of Cutthroat Trout in 2006 has helped put float tubing back on the map at the lake. The Pilot Peaks tend to chase bait near shore in both early fall and late spring. Due to this, they have broadened our effective fishing season when the old Summit Lake strain are hanging out in much deeper water. Over the last three years we have had some great fishing at the lake from pontoon boats and float tubes in October and again in May and early June. So this October we are going to give anglers an opportunity to learn how we fish for giant Lahontans in warmer water earlier and later in the season. We will cover a wide variety of topics including gear, safety, techniques, location and how to use the lake and the varying weather conditions to your advantage. If you have not fished with us in early October at Pyramid you are missing out. This is our new favorite time of year and gives us the opportunity to do some things we can not do other times of the year. Come join us for a really fun weekend on the lake and get a chance to catch a fish of a lifetime. October is also a great time to camp at Pyramid Lake ($15 a night). What’s included: Weekend on the water with our veteran guides, Lunch both days, some gear and swag from our numerous sponsors, corporate room rates at local hotels ($39) and a really fun weekend on the water. What is not included: Tribal Fishing Permits, float tube or pontoon boat. Tips and Gratuities.